A brand new trailer has been unleashed for the Tom Hardy-starring Venom and it showcases much more from the title character. There are some great moments of visuals, a tease of the wit that will coincide with the action-horror and plenty, plenty of Venom itself. The film’s plot is said to be inspired by the story of 1993’s Lethal Protector six-issue miniseries, which begins with Spider-Man and Venom coming to a truce, agreeing that Venom will move to San Francisco. The trailer shows Hardy coming to terms with his merge with the symbiote, admitting that he has a “parasite” within him. 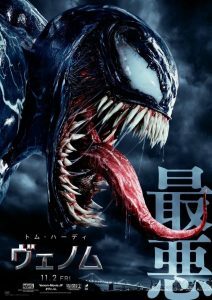 Additionally, check out the awesome, gruesome Japanese poster art for Venom below. I wonder if we’ll be treated to something so terrifying. Venom comes from Zombieland director Ruben Fleischer and additionally stars alongside Michelle Williams, Woody Harrelson, Tom Holland and Riz Ahmed. Venom will be unleashed on the 5th October 2018.